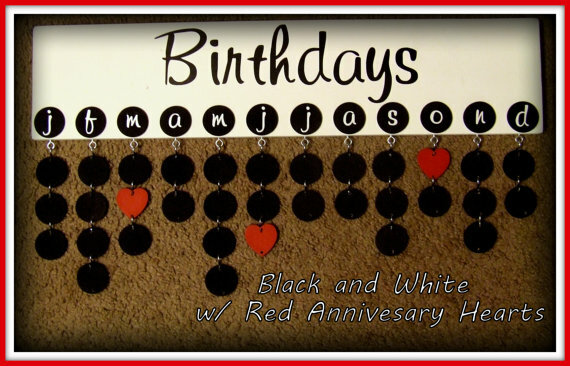 Use a Birthday Board to keep track of all those Birthdays! If you aren’t the winner but want REALLY want a Birthday Board Pearlized has offered a coupon code for I Love My Kid’s fans! Use ‘PEARLIZED5’ for 15% off a $15.00 or more purchase. It expires September 30th! Hurry! 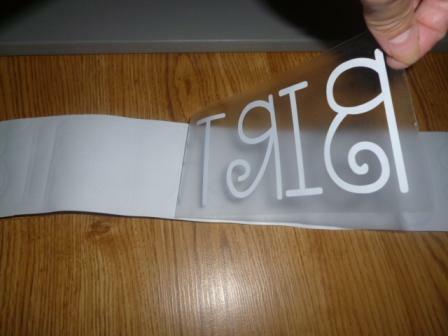 When you purchase a kit from the Etsy shop, you will specify what font of vinyl you want (19 to choose from), what color of vinyl (6 colors), what color of pen (2 choices), etc. It is a very personalized process, which I LOVE! All you have to do is paint and assemble. After much debate I finally decided I wanted to put the birthday board in my dining room. 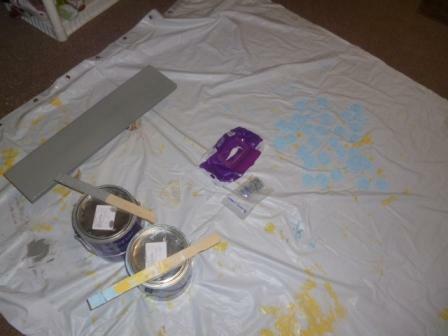 I brought in my blue and grey paint and got painting. First I placed my board on 2 cans of corn, so I could easily get the sides of my board. I then painted the board grey. Next, I painted the circles blue. I just put them on a drop cloth so it would be easy to paint. I found that using a little kid’s art paint brush made getting the sides VERY easy to do…then I painted the tops of them. It was really humid that day so I let it dry over night. 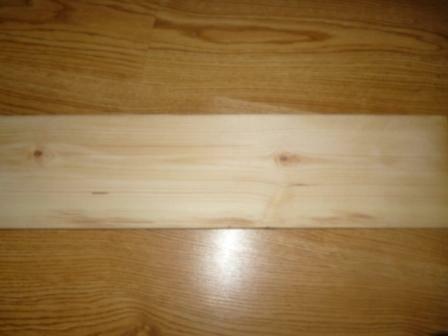 Once I was sure I had the top part up, I simply peeled off the white backing, then placed the words on my board. I did have a rough time getting my letters to stick to my board, I messaged Pearlized and within a couple of hours she replied and had a few suggestions for me to try. I used a credit card (thanks Pearlized for helping me) and rubbed it over the top of the clear lining. This did the trick, the white “Birthday” stuck perfectly to my board! Next I cut out my “months” and arranged them on my board. 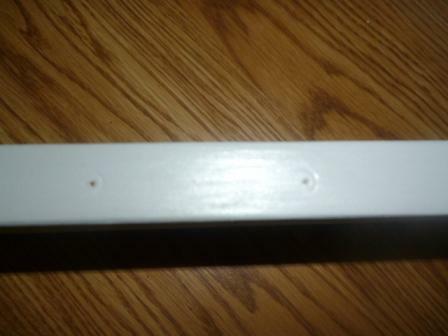 This part was pretty easy to do since the pre-drilled holes showed me exactly where to place my months! 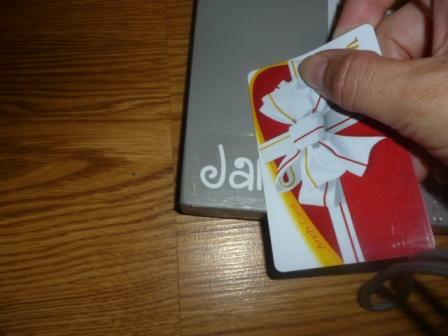 Then I peeled the months and stuck them to my board using the HANDY credit card trick! If you have ever wondered how to apply vinyl easily, this trick is the easiest way! It was looking really good! 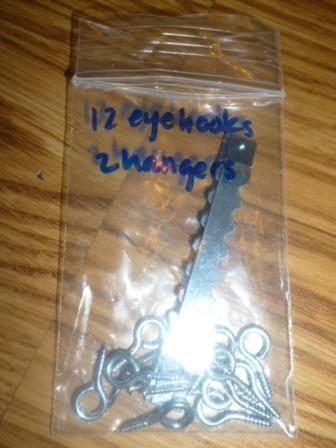 Next I took the 12 eye hooks and twisted them into the pre-drilled holes at the bottom. 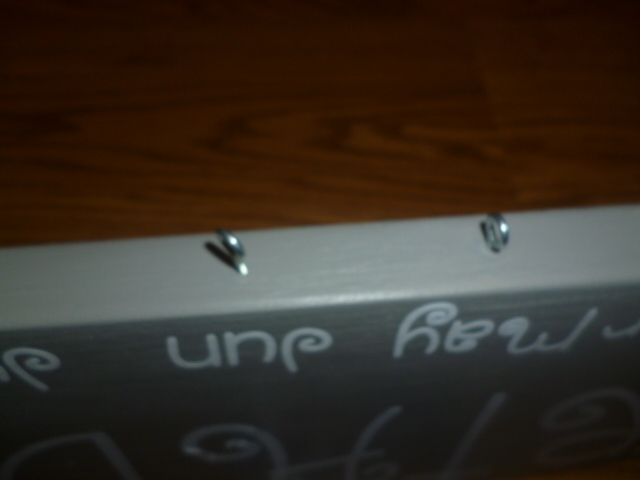 Then I added my saw-tooth hangers to the back side. I didn’t have a hammer near by and I wasn’t running through the rain out to the garage, so I did what I used to do when I was in college and didn’t even own a hammer….I busted out my awesome Sunday shoes! 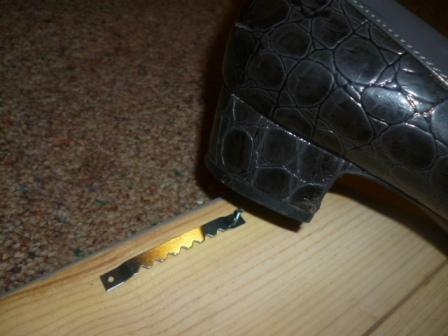 With a quick smack of my (not so) high heel I had the wall hanging hardware on in no time! I loved that the kit even came with the little tiny nails needed to add the back hangers! Cute shoes…right? Got them at a yard sale for 50 cents! 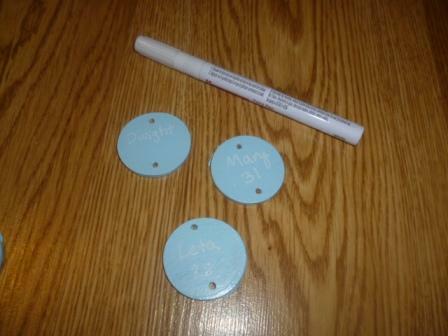 Next I wrote on all of my circles with the included paint marker. Finally I was ready to put it all together, I attached my “S” hooks to the circles and hung up my completed Birthday Board! Once I put it on my wall, I decided that I wanted grey circles instead of blue, so they would stand out against the wall. That is what is so great about these birthday boards…I can change it whenever I want to! Here are some other quick close ups of the finished board! 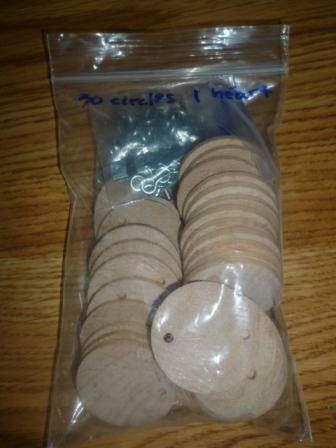 I am currently in the process of painting my circles grey. 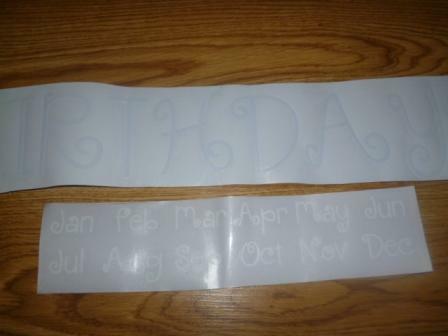 I plan on writing birthday’s on them again tomorrow and I will post an updated picture! I am super happy with my birthday board and LOVE that Pearlized made it so easy for me. All the pre-drilled pieces and just having them all in one spot–made the process SO MUCH EASIER than if I would have tried to gather it all myself! 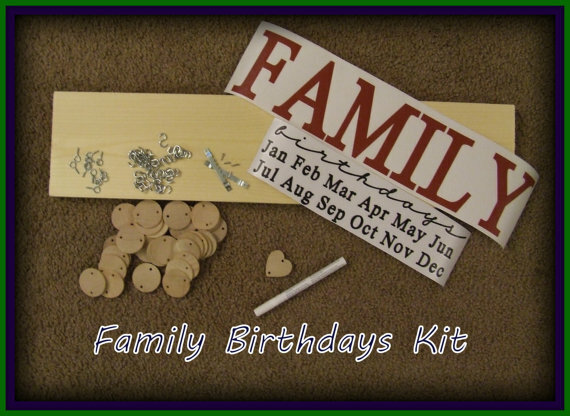 You can purchase a Birthday Board or a Birthday Board Kit on the Pearlized ETSY SITE. You can also follow Pearlized on Facebook and Twitter! 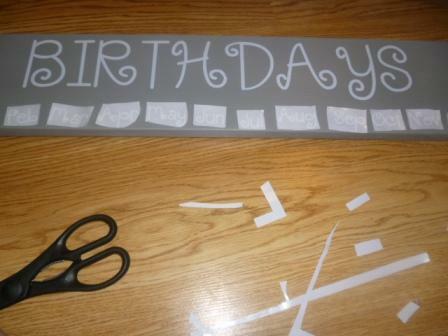 One SUPER lucky winner will win the completed birthday board! This Giveaway is open to US ONLY and it will end on September 17th at 11:59 PM EST. Winner will be chosen at random, be emailed, and have 24 hours to reply or a new winner will be chosen. Only 1 entry is required to get your name in the drawing, but additional OPTIONAL entries have been added if you’d like to increase your chances! It is up to you! GOOD LUCK! Enter on the Rafflecopter Form below. Jennie, you have been emailed and have 24 hours to reply or a new winner will be chosen! Thanks to all who entered and thanks to Pearlized for sponsoring this giveaway! I like the Established Board Plaque! ove the Family Birthdays and the Chalkboard Countdown!! I love the m&m themed birthday board! This is super cute!! Good luck everyone. There are a few things I love on there! I really love the Chalkboard Coundown Calendar and the Inspirational Tile that says “When you have someone you love in Heaven, you have a little bit of Heaven in your home”. I like the chalkboard countdown. I would use if for out current deployment or my upcoming birth to baby #3. I would also luv to have the Chalkboard Countdown Calendar… It’s really cute and such a great idea. I would love the Established Board – Plaque. These are so cool! Would love to win one! I would love to have this birthday counter. I would hang it in my kitchen. Love love love the he stole my heart I stole his last name board! I really like the Chalkboard Countdown and the Family plaque. Would love this one . I tried leaving a blog comment but it wouldn’t let me. So I’m posting here great creative idea birthday board. And the apple cider caramels is a must gonna.have to put my baking skills to the test. Form all ur battles on your knees. I love the Chalkboard Countdown & the Family like Branches on a tree we all grow in different directions yet our roots remain as One Inspirational Tile! I love the established signs…such a cute idea! I adore the Chalkboard Countdown! I would love to get the one that’s “he stole my heart”. This is exactly what I have been wanting, this is my favorite thing from the site! I love the inspirational tiles. I would love the name tile with quote too! They are all so cool!! Thanks for the great idea. I hope I win. I would love the Christmas countdown as well….what a great way to get ready for the holidays. I really want the family birthday one though. I like the chalkboard countdown. I love the tiles with the family name & the chalkboard countdown calendars so very much! I love your site. I’d love to have the birthday board. Thank you!! Love it! I’ve been wanting to make one of the birthday boards ever since I saw the idea on Pinterest! Thanks for a chance to win one. I like the chalkboard countdown chart. I like the M&M themed birthday calendar! Would help e so. Ich to remember everyone’s birth day’s. getting harder and harder to remember them all! I would love some of the other inspirational quote plaques. So creative. There are several that I would love to have! 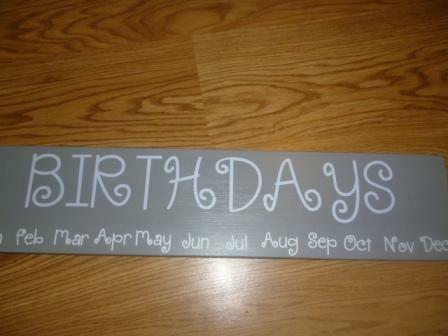 Definitely the Name and initial tile with quote and the family birthday board kit. Thanks! It is true for my family. I like the inspirational saying tile – I could use so many of those items as family gifts! I also love the countdown boards! Would love to have one of these!! We have such a large family! I’ve been trying to think of a creative way to keep up with them outside of just writing them down in a drawer somewhere! Love I!! I love the board, he stole my heart so I stole his last name. Super cute!! 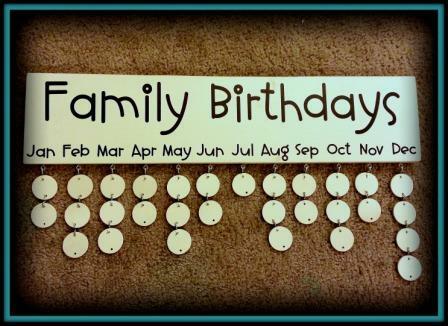 This is such a neat way to keep track of birthdays! I also like the Established Board-Plaque. I like the birthday board that says Family in red letters. I’ve been wanting to buy one of these for so long. Love this!! 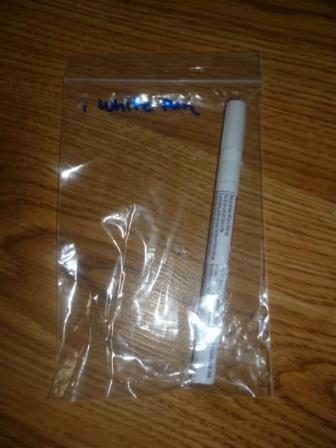 Found it on pinterest a few months ago, but there were no directions, so I was going to take a stab at it…didn’t know that I could get a kit!! I wanted to give one to my grandmother so that she could keep up with all of the grandkids and great grandkids!! Awesome! I love the all of the Established signs too! We just got married in June and I’ve been looking for something like that! I love this Idea it can keep you up on Birthdays. Love the birthday boards! I want to get one for my parents and my in-laws! I love the LDS youth theme! I love the established board and plaque with the family name on it and the year. Really Cute! I would love the black and white themed birthday board! So fun! Love the inspirational saying title! I would like one of the Established Board Plaques. Denita is one of my oldest and best friends. She’s super talented! this has got to be one of the coolest ideas I’ve ever seen. I wish I was crafty so I could actually make one by myself. I will try to win this one because it’s the only way I can possibly get one. I have no talent at all. these are awesome. I love the black and white birthday board. I also love the inspirational plaque that says when you have someone you love in Heaven then you have a little bit of Heaven in your home. those birthday boards are really awesome. Good luck to everyone who has entered !!!!! Denita is my friend and I LOVE her boards! I’ve been wanting one for awhile so I’d love to win one. I plan on buying at least one for me and maybe some for my friends and sisters in law soon even if I don’t win. 🙂 I also LOVE the chalkboard countdown calendar. This would be really great to assist me as the family grows through marriages. I love this! I like the Christmas countdown as well. I love the chalkboard countdown with #’s! I love the Name and Initial Tile w/ quote! It would look amazing on one of my bookshelves! I like the chalkboard count down calendar. Oh the uses for that would rate right up there with the family/birthday board! 🙂 cute! Love this idea. I’m horrible at looking them up on the calendar until the day of and then it’s too late to send a card! 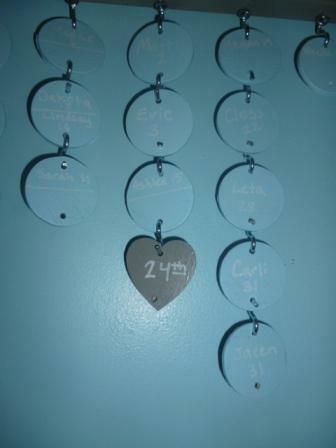 I love the multiple heart/birthday boards to not forget family anniversaries! I’d like to have the Family Birthday Board to give to my father and his wife for Christmas. I like the “Established” 12 x 12 Name Tile. I absolutely ADORE these!! So cute!! I also like the Chalkboard Countdown Calendar. I would love the inspirational saying that says “Family like branches on a tree we all grow in different directions yet our roots remain as one”. I love the initial tiles and also the inspirational tile with the Family on it. They are all great! Love this, what an awesome idea!! Love this. My 84 yr old Mom needs this to remember family birthdays! I love teh Chalkboard Countdown Calender!!!! I love the God doesn’t give us more than we can handle inspirational tile! I like the Name and Initial Tile w/ quote. The “established” plaque is neat! Would love to win this. It looks awesome and be super easy to use. Id love to have the chalkboard countdown calendar. My kids would love it & it would help me remember dates & etc. this would be great for my grandma and I! I would love to have this board, what a concept. Nice to write and plan ahead of time for no mix ups on dates and rescheduling around the routines of daily chores. Chalkboard is the best one. This is a great idea! I would love to give this to my Gram so that she can keep track of her 14 grand-kids birthdays! I like the birthday board never forget a birthday again that comes in multiple colors. I love the “days until” countdown! I’d love that! I love the impossible inspirational tile! I like the inspirational tiles. I like the initial and a quote tile. So CUTE! i love the inspirational tiles- especially the family one 🙂 i also think the chalkboard countdown boards super cute! I love the vintage book pumpkins!!! I like the established board. I liked the countdown broads. I love the tile that says When you have someone you love in Heaven, you have a little bit of Heaven in your home. I like the inspirational saying tile with “God doesn’t give us what we can handle, God helps us handle what we are given.” I know a few people who have went through hard times that could really use hearing that! I love the countdown calendars! I like the Countdown Chalkboard. I like the God helps us handle what He gives us. I would LOVE one of these for my mother! I like the name with initial tile and quote. 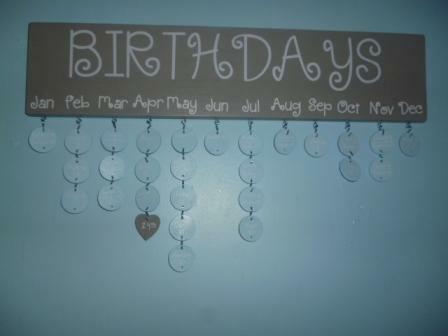 LOVE the birthday tracker and the established tile! Name with Initial Tile and Quote. I like the chalkboard countdown calendar. I’d like to have an “established” board for our house. I like the inspirational saying about God not giving you more than you can handle. Chalkboard countdown to name one I would want!! What a neat idea, love it. Thank you for the oppurtunity! Established board! I love those!!! super cute! I would love the initial tile with quote. I would love the Chalkboard Countdown Calendar! What an awesome idea!! What a cute idea! I too have too many family members to remember. One of my sisters has 12 kids! I come from a family of 10 kids, and my husband is one of 7. As you can imagine, Christmas is huge!! I love this idea. Grandma would love it. I also love the Husband last name sign. Very cute idea for a wedding gift. I love the “Established” 12″ tile. So cute! Thanks for a great giveaway! I would love the name with initial and saying sign/board. Looks so sweet snd woukd go grwat in my bedroom! Thankyou for offering a giveaway! I love the inspirational tile – it would be fabulous in my house! I like the M&Ms themed birthday board and the “Established” family nameplate. I love the birthday board, a grea way to never forget family birthdays. I love the birthday board, a great way to never forget family birthdays. I really like the name and initial tile. I am in love with this birthday board though too! I also love the inspirational tiles, especially the one about if you have someone in heaven. <3 it!! I love the Birthday Board! My family isn’t that large but it is growing! Thank you for the chance! i love the chalkboard countdown calendar. I love the family established sign!!! These are such a neat idea! The Inspirational Saying tiles are my favorite. They are a great way to keep thinking positive. I would love to have the family country themed board. Love all the different colors. I love the plaque that says, “Nothing is impossible. The word itself says Im possible” I love that saying. I just saw these for the first time today and absolutely love them! I want to purchase several to give as gifts for Christmas! forgot to mention, I LOVE THEM ALL!!! that’s AWESOME!! I totally want one! What a great giveaway! I love all the family birthday or special days boards. I could definitely use one to keep me straight. Thanks for a wonderful giveaway! I like the family sign on the bottom left. I like the Countdown Calendar. I really want a birthday board! I Love the entire idea. So cute. 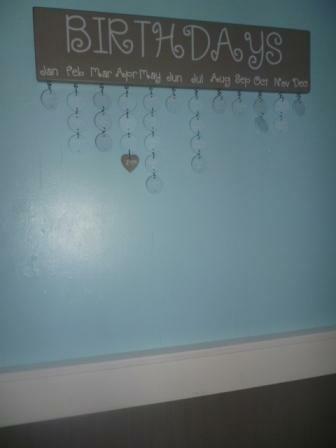 I loved the family birthday board, just not sure if i would want our last name instead of family. Would love to win the birthday board, I think it’s a great idea!! Family is like branches on a tree….saying .